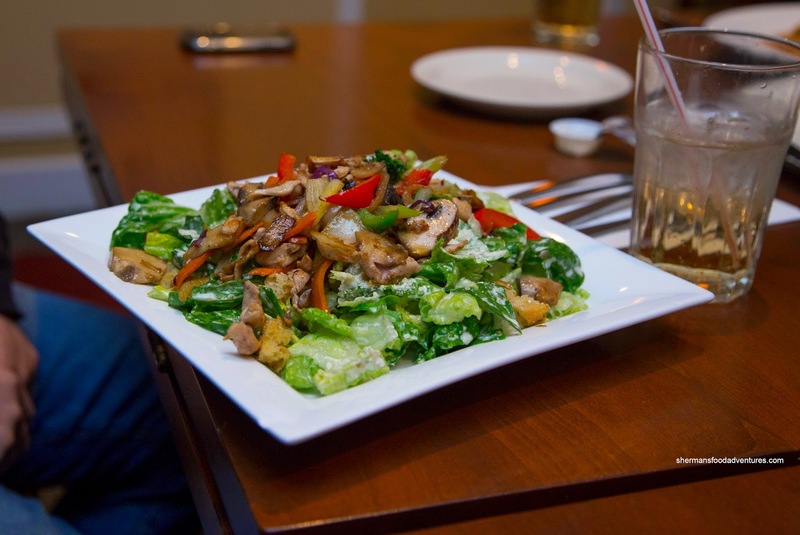 Sometimes location and convenience supersedes any other reason when it comes to restaurant selection. With Apu and Gordo joining us for eats after Friday night hockey, we needed to find a place near them. Furthermore, Gordo wanted to go for Italian which narrowed our choices even more. We ended up meeting at Amorosa Pasta House, which now shares the same dining space as Santali Souvlaki House. We've been here before and my best description of the place would be "Anton's lite". For me, I visited the place recently with Costanza and ended up with a pasta. This time around, I went Greek and had the Kleftiko. 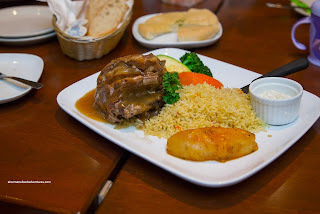 This was a healthy portion which was mostly tender and moist. Like with any piece of lamb shoulder, there are some leaner sections. Despite being garlicky and well-seasoned, the thickened sauce was more akin to gravy. The side of veggies were on point while the rice was appealingly chewy. Seeing how I wanted a bit more variety, I also got the large Linguine & Clams in white wine cream sauce. As evidenced in the picture, there was enough sauce for another plate of pasta. 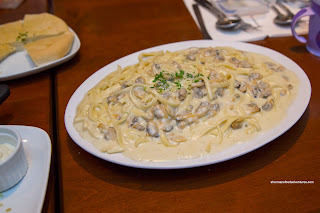 Hence, the entire plate was very creamy where the pasta was on the softer side. Flavours were mild even with the plethora of baby clams. 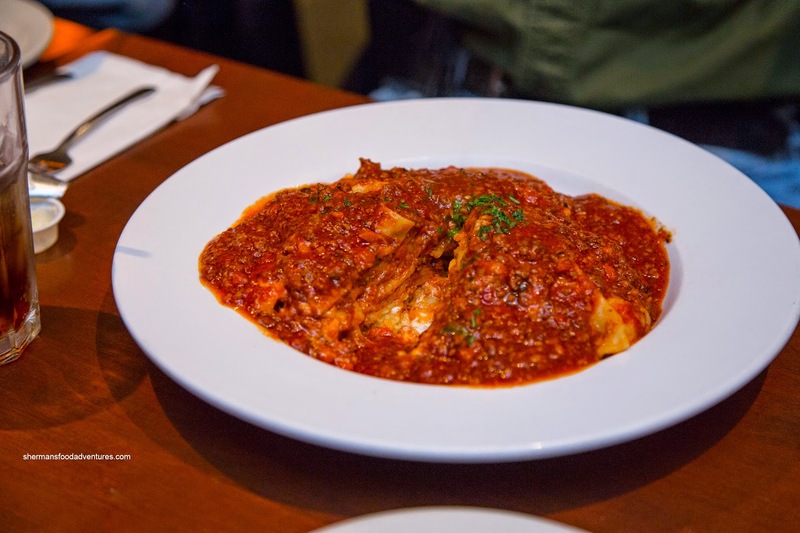 Milhouse went big with the Vitello alla Parmigiana with ravoili in meat sauce. The large piece of veal was a little dry, but not overly so. It was hidden by the huge amount of melted cheese. As for the ravioli, it wasn't exactly al dente, but hardly mushy either since the texture was rather firm. Meaty, slightly tart and a touch sweet, there was enough tomato sauce to coat each piece and more. Gordo wasn't very hungry and ended up with a Hot Chicken Caeser. Um, wasn't he the one who wanted to eat Italian??? Next time, we're ignoring his requests! Whatever the case, the salad was pretty good being dressed just enough while sported a good amount of tender chicken and veggies. 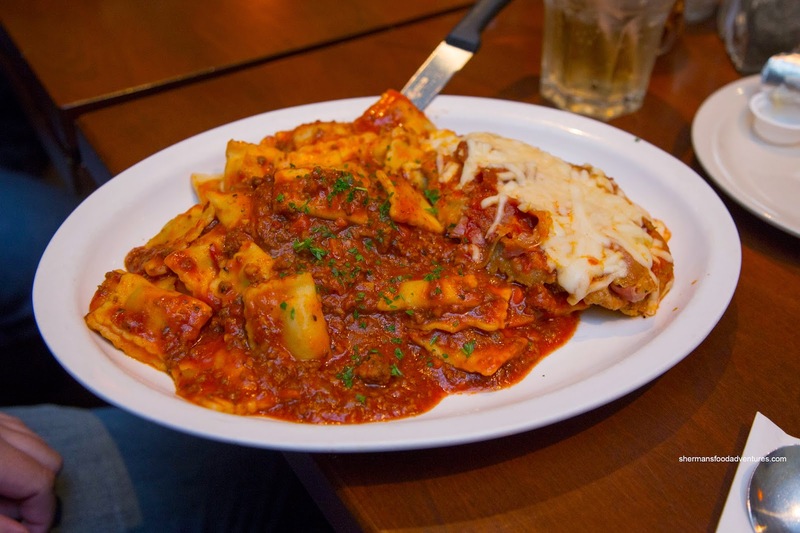 Apu ended up with the Lasagna with meat sauce... and wow, that was a lot of meat sauce! Well, I guess that was where all the meat resided because the actual lasagna contained very few ingredients other than a bit of cheese. With that being said, the dish was not bad for what it was. The layers of pasta were not too soft while the meat sauce was exactly like the one in Milhouse's dish. 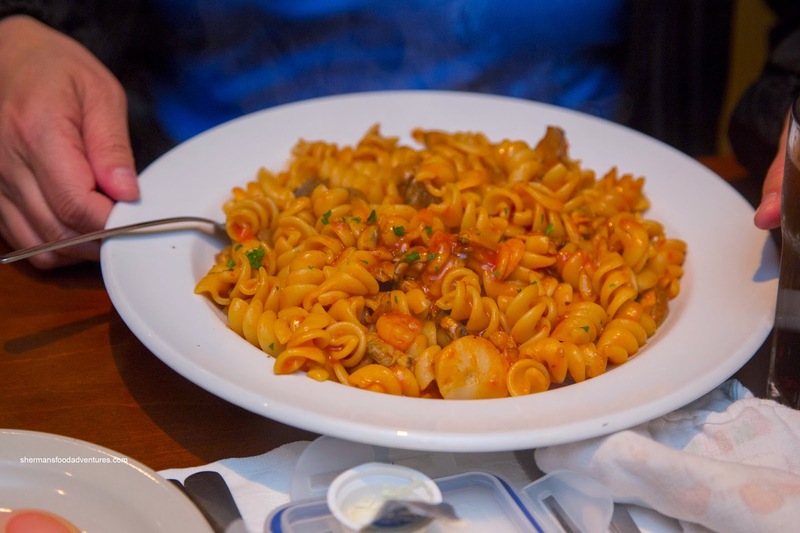 Manjula decided on the Rotini Pescatore with clams, shrimp, scallops & mushrooms in tomato sauce. I've had this dish on another recent visit and this time it was exactly the same. That meant there was hardly any seafood, but lots of mushrooms. Flavours were mild with only the slightest hint of tang. Lionel Hutz went a little off the board and had the Seafood and Sausage Rice. 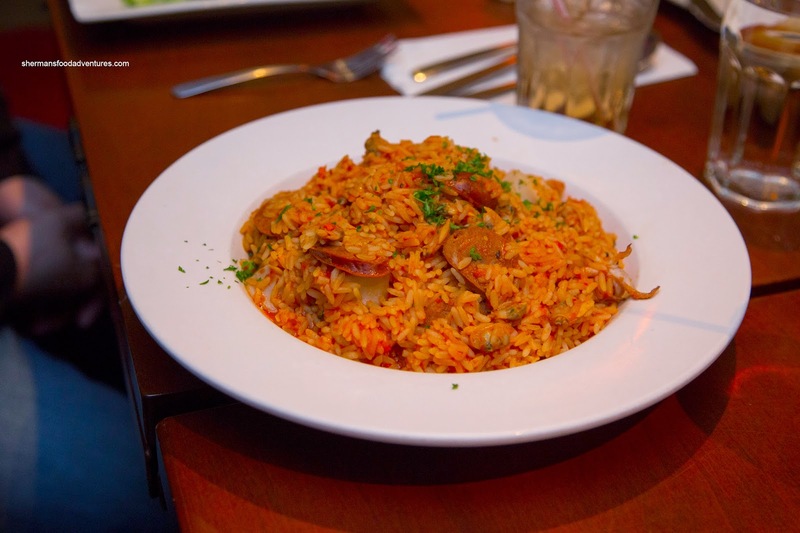 This was a pretty straightforward dish with lots of meaty sausage and a modest amount of seafood. He liked the overall flavour of the rice as there was a slight spice and brininess to it, but the rice itself was a bit undercooked. But as you can clearly see the portion size for his rice and really, the rest of the food we ate, was fairly large. As much as there were issues with some dishes, the overriding factor is value. 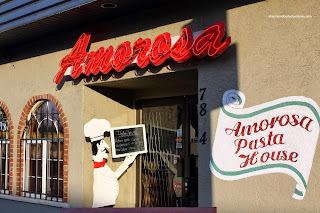 Much like Anton's and Stepho's, Amorosa offers up good portions for the money, however, the food quality is probably a bit better. As long as they don't have Anton's sized line-ups to get in, I might have to give them another try. I gave up on them several years ago because they were always understaffed and the service was very slow and confused. As I recall, the spicy Creola pasta was pretty tasty.